There are over 300 days of sunshine to be enjoyed in Colorado Springs annually. 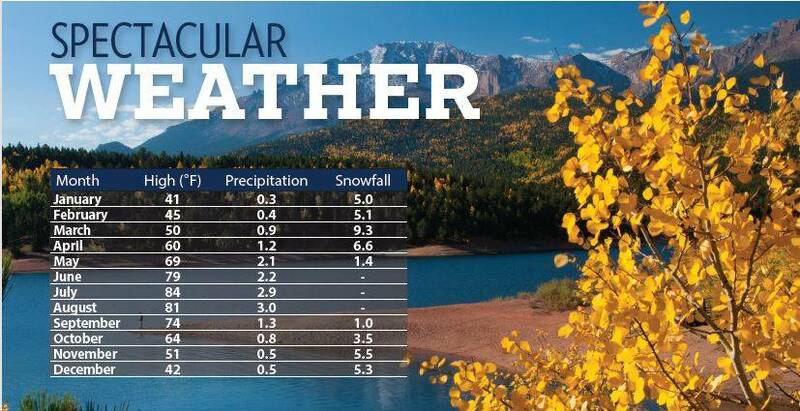 At an altitude of 6,035 feet, the climate of Colorado Springs and the Pikes Peak region is warm in the summer and moderate in the spring, fall and winter. Located directly off of Interstate 25, just 20 minutes from the Colorado Springs Airport or 1½ hours by car from Denver's International Airport. Shuttle service and ground transportation are available at both airports. The Colorado Springs Airport serves five airlines with non-stop flights to many major hub cities with easy connecting flights to destinations all over the world. There are over 300 days of sunshine to be enjoyed in Colorado Springs annually. At an altitude of 6,035 feet, the climate of Colorado Springs and the Pikes Peak region is warm in the summer and moderate in the spring, fall and winter. Classified as an "alpine desert," the dry, clean air was once a destination to heal tuberculosis patients. Today, visitors enjoy the climate because it allows for year-round outdoor recreation. Summers are dry with temperatures in the 80s to mid 90s, with cool nights in the 60s. Spring and fall temperatures range from the mid 50s to the low 70s and winters here can be white, but normally the snow that does fall melts quickly and reveals a sunny sky again. Winter temperatures range from the low 30s to upper 40s. Visitors can rest their head at locations ranging from AAA Five Star luxury to secluded retreat centers and charming B&B's. There are more than 14,500 rooms that are offered at various locations througout the region. Popular flags like Hilton, Marriott, Embassy are easily found alongside true Colorado choices like The Cliff House at Pikes Peak, Glen Erie Castle and Cheyenne Mountain Resort. The area specializes in small, to medium-sized meetings and conventions with 450,000+ square feet of flexible meeting space.Large events can be accommodated by The BROADMOOR World Arena, The BROADMOOR Hotel, Cheyenne Mountain Resort, DoubleTree by Hilton, Colorado Springs Marriott, The Antlers Hilton and Hotel Elegante Conference & Event Center. The region has a wide variety of museums, performance centers, art displays and galleries. Wander the the Colorado Springs Fine Arts Center, Manitou Art Center or the galleries in Old Colorado City. Enjoy nationally traveling talent at The BROADMOOR World Arena or Pikes Peak Center. View other riveting performances at The Mezzanine, Theatreworks, Colorado Springs Philharmonic and the Millibo Art Theatre. Visitors can enjoy over 55 natural and man-made attractions including the U.S. Air Force Academy, U.S. Olympic Training Center, Royal Gorge Bridge & Park, Pikes Peak - America's Mountain, Garden of the Gods Park, Seven Falls, Cave of the Winds and Cheyenne Mountain Zoo. The region also offers whitewater rafting on the Arkansas River, biking, hiking and horseback riding through Garden of the Gods. Discover the ways that tourism pays for Colorado Springs & the Pikes Peak Region.